Ring in the new year by joining the Port Townsend Marine Science Center for an early winter bird migration cruise to Protection Island or south toward Port Ludlow, weather depending, on Monday, December 31st. The three-hour trip leaves from Port Townsend’s Point Hudson Marina at 1 p.m. This delightful boat expedition, in collaboration with Puget Sound Express, is an ideal way to spend New Year’s Eve with family and friends. Cruises are aboard a comfortable, enclosed, heated motor-yacht. The trip offers a unique opportunity for an idyllic natural science adventure, enabling people to gain a better understanding of our marine ecosystems and interrelationships which abound in these waters. If the weather is good, the cruise will go to Protection Island—a National Wildlife Refuge located at the mouth of Discovery Bay—or it may head south toward Port Ludlow to remain in protected waters, if the weather is rough. The New Year’s Eve cruise departs from Hudson Point Marina, in downtown Port Townsend, leaving at 1 p.m. and returning at 4 p.m. on Dec. 31st. Tickets are $55 per person ($50 for members of the PTMSC, Burke Museum, Audubon or the Washington Ornithological Society). Proceeds from the trip help to fund PTMSC programs. Trips may include an additional stop at the Kilisut Harbor/Mystery Bay area (between Marrowstone and Indian Islands). On-board refreshments are available. For reservations, please call the Port Townsend Marine Science Center at (360) 385-5582 or 1 (800) 566-3932 or e-mail at cruises@ptmsc.org for additional information. There has been a lot happening in the Marine Exhibit over the past few weeks. 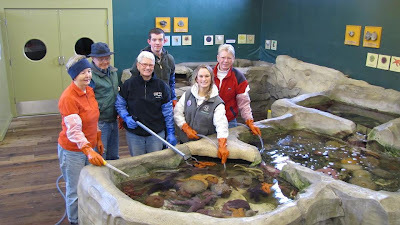 Since we have been closed to the public I thought I would make a blog post to inform you about recent events in the aquarium of the Port Townsend Marine Science Center. In the beginning of November we took down the piling and cluster tanks. 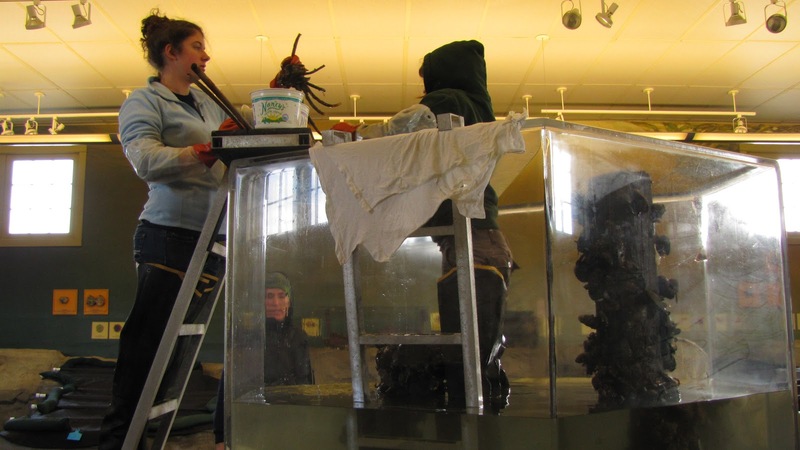 Running a free circulating saltwater aquarium involves a lot of maintenance. The water you see in our tanks comes in unfiltered and contains many planktonic animals looking for a suitable surface to settle onto and grow. Every winter we take down our tanks and let them dry out so that we can thoroughly clean all the plumbing. You would be amazed at how much can grow inside all the pipes in just one season! All four of the AmeriCorps members worked together to clean out the tanks. 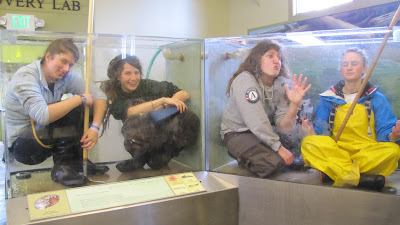 We are able to get it done all in one day, and had a blast cleaning the tanks and releasing all the animals. After spending the summer months educating visitors about marine habitat, our resident fish and marine invertebrates are returned to their homes in the ocean in the same or similar place in which they were collected. Check out the video of one of the two Red Octopuses we had this year being released right off the PTMSC dock! For those of you that know the exhibit, this was the octopus that was in the rocky cluster tank, living in the empty barnicle. There are a few animals that are year-long residents, but most only spend a few months of their lives here with us. We are currently running twice weekly homecrews where an amazing team of dedicated volunteers help clean the tanks and feed the animals that will stay with us this winter. As many of you have seen on our facebook page, our little Red Octopus’s eggs began to hatch while a volunteer was cleaning her tank during homecrew last week. 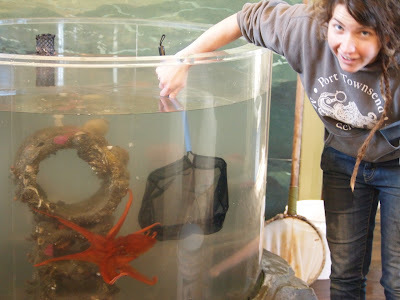 Our Red Octopus, Octopus rubscens, named R2 was collected by a diver on March 31st, 2012. 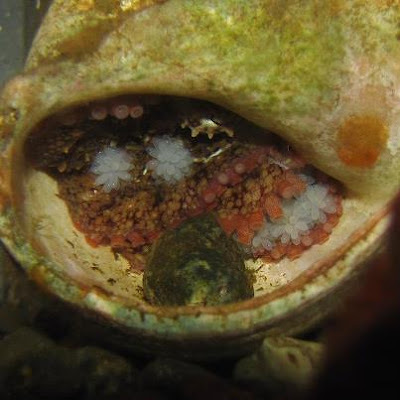 Her eggs were first discovered on July 14th, 2012 and they began hatching on December 1st, 2012. After mating, the Red Octopus is able to hold sperm until it is ready to lay eggs. This means that our octopus had mated before she was collected. 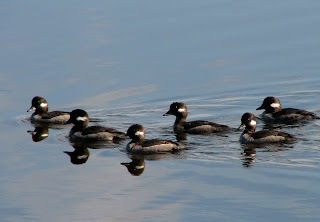 They lay a few thousand to tens of thousands of eggs (I have found 4,000-45,000 and 1,000-19,000 and 2,000-3,000 in different scientific papers.) Hatching usually occurs over a week or so. It took our octopuses eggs 20 weeks or 140 days to hatch. After hatching, the octopus larvae live planktonically, meaning they are drifters in the ocean. Because of this, raising baby Red Octopus in captivity is incredibly difficult and has never been successfully done. After our octopus eggs hatched, we removed the babies and released them into the ocean so they would have the best chance at survival. A few were kept for observation in a planktonkriesel tank, which is specially designed to hold planktonic organisms. R2’s eggs should continue to hatch for about another week or so. After they have all hatched, R2 will die. Octopuses lay only one clutch of eggs in their life. After laying eggs, the females stop eating and spend all their time guarding and tending to the eggs. After the eggs hatch the mothers die. Red Octopuses live for only about 2 years. Emily and Danae worked together to get some amazing microscope pictures of the newly hatched octopus larvae. ﻿﻿﻿ The Red Octopus hatchlings are about the size of a grain of rice and have visible chromatophores, the specialized cells that give octopuses their spectacular color-changing ability. Check out our YouTube video of the Red Octopus eggs hatching! Our Giant Pacific Octopus, G3PO, spreads out upon first being released into the round tank. ﻿ We have also recently moved our Giant Pacific Octopus to the large round tank since it has been growing so fast. She seems to be right at home in her new tank and has a new favorite food of choice, Scallops! She went on a rampage right after moving in and devoured most of the Scallops in the tank. This move required a little bit of shuffling around, the Puget Sound King Crab is back in the wall tank and the Rock Fish and Red Irish Lord have been given a temporary home in a large fiberglass tank in the middle of the exhibit. They will have to share their old tank with the GPO for a few more months until the GPO grows too big and will be released to find a mate and continue her life in our wonderful Salish Sea! Come by and check out the changes to the Marine Exhibit the weekend after Christmas, December 28th,29th, and 30th from 12-4 with the public feed at 2pm Saturday. It will be your last chance until the exhibit re-opens April 5th 2013! Please continue to follow us on our facebook for more updates from the Port Townsend Marine Science Center!